It will be a year, according to the Chinese Horoscope 2019 for Rabbit, in which the natives will have to face strong emotional problems as an emotional cycle comes to an end. For this reason, during the first four months it is essential to analyze emotions and remove all obstacles that prevent them from clarifying theirselves. Relationships that arise and do not help to progress should be eliminated at the root, to avoid a slowdown in personal development. The divine forces will be optimal when making decisions during the year of the Pig. It is time to cleanse and put an end to everything that does not allow you to be happy. Therefore, you must take advantage of the months of May and July, which are those that will endow you with a great deal of vitality, which you must direct in order to achieve progress in life. Those who were born in the years 1903, 1915, 1927, 1939, 1951, 1963, 1975, 1987, 1999 and 2011 are part of this Horoscope. It will be a year that will give rise to complicated relationships in marriages. A time in which the natives will be lost at the time of finding the most suitable solutions to be able to solve their problems. A hard period in which it will be necessary to have patience and desire to save the relation. Of course, the solution to the problems of a couple will not be to have a child. They will have to wait until the end of the year for the sentimental situation to improve considerably. Then it will be the right time for the relationship to renew and improve. According to the Chinese Horoscope 2019 for Rabbit, the first half of the year will be a fantastic period for earning money. However, it is important to use them for useful purposes and avoid unnecessary expenses. The ideal is to use this economic income for long-term investments that can help in the future. The year of the Pig is indicated to finish paying those loans that you have pending. In the case of business persons, it is the right time to venture into various areas where you can earn more income. The Chinese Horoscope 2019 for Rabbit predicts a magnificent time to improve personal relationships with parents, siblings, uncles or cousins. You just have to know how to put yourself in other people’s shoes and understand their points of view in order to get along with everyone. 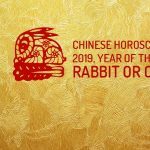 Therefore, the Chinese Horoscope 2019 for Rabbit indicates that its natives will be practical people when it comes to solving the difficulties that present themselves and this will prevent them from getting out of control.